On 25 March 2016, president Lukashenka confirmed his support for the gradual 3 year increase of the retirement age, currently at 55 years for women and 60 years for men. The government had been discussing the pension reform in the previous years, but the president dismissed it as “untimely.” Now, with the presidential elections in the past, Lukashenka is determined to proceed with the unpopular measures. Surprisingly, along with the reactions from the Belarusians, the Russian ambassador to Belarus, Aleksandr Surikov felt the need to make a statement on the Belarusian pension reform. On 31 March, he hinted that people might start looking for jobs and better retirement options elsewhere. Obviously, he implied migration to Russia, which along with Belarus, currently is leading the list of countries with the lowest retirement age. By contrast, global trends reveal that the retirement age in most countries of the world lies between 60 and 65 years. Demographic challenges might move it even beyond 65 years, as the debates in the U.S., France, and Spain indicate. Currently, rapid ageing places the Belarusian economy under pressure. The ratio of retired people to the working population already lies at 61 to 100. Increasing the retirement age appears to be the easiest solution in this situation. Alternatively, the state could lower already negligible pension payments or reform the entire social security system. Finally, Belarus could open up for migration, but this solution is even less likely to appeal to the government and the population. In 2016, the Belarusian government hurried to draft the pension reform, to take effect in January 2017. Three basic scenarios emerged. In the first, the Minister of Social Security, Mariana Shchotkina supported the 5 year increase of the retirement age. She argued that it would be the most practical and economically logical decision. The second, “demographic” or “gender” scenario, reflected the existing gap in the male and female life expectancy. According to Belstat, women live longer than men by 11 years on the average. Assuming that a retired person receives pension for approximately 20 years, the government suggested to increase the retirement age for 5 and 3 years for women and men respectively. Eventually, president Lukashenka chose the mildest and the most reluctant among the three scenarios. It suggests raising current retirement age by 3 years. With the gradual increase by 6 months over the next 6 years, women would retire at 58 and men at 63. Independent experts criticised all three options, pointing out that in the long run they still would again put pressures on the social security system. Realistically, Belarus should plan to increase the retirement age to 65 years, both for women and men. This would be in line with the recent global trends towards gender equality in the right to retire. On 25 March 2016, Lukashenka expressed his gratitude to the youth and seniors for their alleged support of the pension reform. However, a survey conducted by IISEPS in December 2015, show that 73 per cent of respondents spoke against raising the retirement age. The main argument is that many people would not be able to live that long. Another 20 per cent agreed to the increase of the retirement age, yet connected this step to the increase of the pension payments as well. Many people in Belarus continue working after they reach the retirement age. However, one of the paradoxes is that they receive the regular salary along with the pension payments. As of 1 January 2016, out of a total of 2,592,800 pensioners in Belarus, 651,000 retired people continued working. In other words, every fourth pensioner received double income. Former employees of the military and law enforcement institutions, who retire early upon reaching the age of 45 or 50, often use this possibility to make extra money. Tut.by cites a typical example of this trend: a 48-year old former police officer with a pension of about $320 (on par with an average salary in the country) is seeking a job with salary expectations of about $400. State bureaucracy also benefits from this scheme. For instance, the head of the Central Electoral Commission, Lidzia Yarmoshyna admitted in the media that that she received an average pension of about $160 USD in addition to her regular salary, exceeding $800. While for a state official such a pension might appear as an additional pleasant bonus, for other categories of retired Belarusians it remains the main source of income. 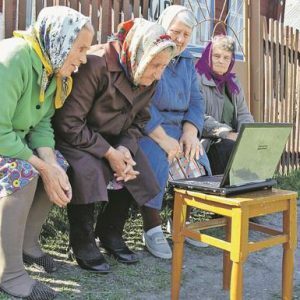 Recently, several stories of ordinary Belarusian seniors went viral online, bringing to light a number of issues that pensioners face in their everyday life. These range from economic difficulties to problems of social integration. In February 2016, Belarusian Facebook users organised a support campaign for a 74-year old man, who sold handmade bird’s houses in a pedestrian underpass in the centre of Minsk. Another story featured a 86-year old woman on crutches who is selling handmade mittens and socks at the Niamiha subway station in Minsk, despite the cold and humid March weather. However, seniors are humble and refuse to complain of financial difficulties. Rather, they emphasise the need to pursue hobbies, keep active, and socialise. At the same time, the state strives to provide the basic necessary levels of social support for the pensioners. For instance, seniors who do not have close relatives, qualify for social services free of charge. These include visits of the social worker, who assists the pensioners with regular medications and grocery shopping, everyday chores, and, if applicable, basic gardening on the private plot. In 2012, the government introduced the system of targeted support for the most vulnerable population groups. These include including retired people over 70 years old with low incomes. They qualify for the additional monthly social benefits or special one-time payments. Pension reform in Belarus is necessary and long overdue. Yet raising the retirement age alone will not eliminate all strains on the social security system. In the long run, the state should diversify its strategies and develop funded pension plans, as it has been done in Poland or Latvia. However, this option will be viable only in the conditions of a stable economy, thus requiring genuine commitment to structural reforms. Stallholders gather outside Tax Ministry's to demand abolition of new rules – no breakthrough though. Authorities suspend criminal case against former presidential candidate Alieś Michalievič. Press Club Belarus holds official opening ceremony in Minsk. Decree 98 will not affect calls inside Skype and Viber. BISS and Press Club launch Analytical Club governed by Chatham House rules. Liberal Club held a round table devoted to the reform of the pension system in Belarus. Freedom Day opposition action is held in Minsk on March 25. Minsk authorities allowed to conduct the march. The Belarusian democratic community celebrates Freedom Day (March 25) every year. The independence of the Belarusian People’s Republic was announced on this day in 1918. This is considered to be the most important date in the modern Belarusian statehood. Court tried to convict Uladzimir Mackievič for participating in a rally, who, meanwhile was outside Belarus. The philosopher Uladzimir Mackievič presented the plane tickets and a stamp in the passport, which confirm that on the day of the rally he was in Warsaw, though the riot police, who were testifying in court claimed to have seen Mackievič​ at the demonstration. The Central district court of Minsk sent the case for additional investigation. Minsk court considering 17 cases of protesters during one day. On March 24, judges of Centralny district court of Minsk considered 17 administrative cases opened against a number of participants in unsanctioned protest rallies, which were held by Belarusian entrepreneurs in February and March. Almost all protesters were punished by fines up to 50 base units (around $520). Minsk Spring – 20 years. The history of street protests in Belarus. The webportal TUT.by in its infographics traces the history of the Belarusian notable protests since the late 1980s. Minsk Spring 1996 took place on the eve of the signing of the integration agreements with Russia and raised the largest protest activity in Belarus when the number of participants reached 30-60 thousand people. Criminal case against Michalievič suspended. However, the case can be reopened any time. Alieś Michalievič, as well as other presidential candidates, was arrested on December 20, 2010, on charges of organising “mass disorders”. After 4-year political asylum in the Czech Republic, he returned to Belarus in September 2015. Press Club Belarus opened up officially in Minsk. The opening ceremony on March 15 was attended by more than 60 guests, including Jaroslaw Wlodarczyk, General Secretary of the International Association of Press Clubs. Press Club Belarus’ headquarters are now located on Viery Charužaj str. 3/601. This week, the new space hosts a meeting and a master class of Tatsiana Repkova from Slovakia, founder of Media Managers Club. Calls inside Skype and Viber not affected by decree 98. The Operational and Analytical Centre has published answers to questions about the effect of the new Decree 98 "On Improving the Transmission of Electronic Messages." It became clear that the calls between subscribers of programmes like Skype and Viber are not covered by the ban. The same is true about CLIR, anonymisers and VPN. The main purpose of the decree is to fight with the gray traffic. MediaBarCamp 2016. On May 26-29, Lithuania will host MediaBarCamp, a unique international non-conference on New Media and media activism. The main purpose of the MediaBarCamp is to stimulate New Media projects development in Belarus. Organised by Swedish International Liberal Centre (SILC), the non-conference is conducted to arrange coordination between existing projects and to establish new contacts. Participation is free of charge. Expert-analytical club launched in Minsk. The first meeting was devoted to the Belarusian-Russian relations and organised by BISS and Press Club Belarus. The Club is regulated by Chatham House rules – all information articulated at an event can be used without any personification. The meeting was attended by independent experts, journalists, representatives of state bodies and Embassies. It is planned that the Club's meetings will take place on a monthly basis. Liberal Club held a round table devoted to the reform of the pension system in Belarus. The meeting on March 16 aimed to discuss the changes in the Belarusian pension system that anyway have to happen in the coming years. The experts were Anton Boltačka, Liberal Club, Kaciaryna Barnukova, BEROC, as well as economist Uladzimir Paplyka who presented his vision of the pension reform in the country. Year in the Bologna Process: What do Belarusians think? The next debate in the series What Do Belarusians Think? will take place on March 28, in the Minsk Gallery TUT.BY. The discussion is organised by the Office for European Expertise and Communications (OEEC) and dedicated to the quality of higher education in Belarus and the role of students in university governance. The live broadcast will be available. Economic preferences of Belarusians under the economic crisis have changed slightly. According to the IISEPS March national poll, the crisis in the country is recognized by 87.8% of Belarusians, but the collapse of the Belarusian model – only 24%. The crisis has not led to a reassessment of the economic ideas of Belarusians – In particular, they do not lose their trust in the effectiveness of state property. What reforms the Belarusian authorities will hold in exchange for a Eurasian credit. On March 28, the Eurasian Fund for Stabilisation and Development (EFSD) approved the provision of a new loan of $2 billion to Belarus. Director of the EFSD Project Group on financial loans, Alisher Mirzoyev explains what reforms the loan is intended to support in Belarusian economy. IBRD loan agreement to improve public finance management in Belarus signed. A $10 million loan agreement between Belarus and the International Bank for Reconstruction and Development (IBRD) was signed in Minsk on April 1. The loan has been provided to increase the effectiveness and transparency of public finance management in Belarus in line with a government-approved strategy. Lukashenka: No need of reforms in education, we must improve what we have. According to the Belarus' president, "we got good education system since the Soviet times. We transformed it, returned to it several times, to write new textbooks, etc." Strategy of reforming of state organizations will be ready by September 1. By an order of the Belarus’ Prime Minister, an inter-departmental coordination group on the reform of public administration and management of state assets has been established. The group should draft a related comprehensive strategy by September 1.